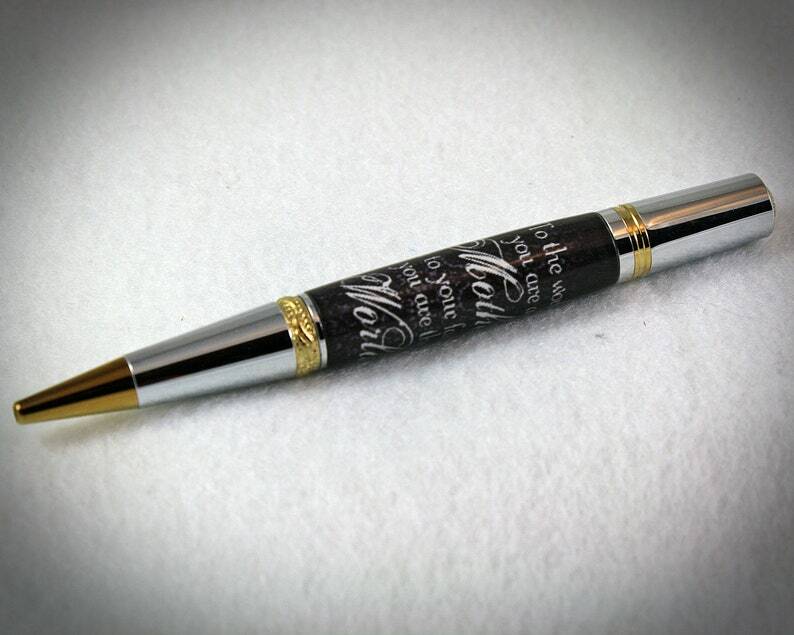 This stylish ballpoint pen is the perfect gift for a Mother. It's a gift she will use every day and each time she does she will be reminded of your love for her by the message the pen contains. "To The World You Are A Mother, But To Your Family You Are The World." What a great Mother's Day or Birthday Gift! Or just give it to her for no particular reason at all other than to remind her how special she is to you. +This unique pen accepts a “Parker ®” style refill. Length 3.875” (9.84cm) Diameter .22” (5.8mm). Ohio Penworks installs a premium quality Schmidt medium point easyFlow 9000 refill in the buyers choice of black or blue. “Parker ®” style refills are manufactured by numerous companies including Acme, Fisher Space Pen, Parker, Monte Verde, Pelikan, Schmidt & Visconti. They are available wherever office supplies are sold. +Approximately 5.25" long, 0.5" at it's widest point. A pen makes a great gift for any occasion. When looking for a special gift for someone please remember to visit OhioPenworks.com. Better yet, treat yourself to a quality pen from Ohio Penworks today.